I recently got a great surprise in the mail from Simon Felton in the U.K. – something that only another true SMiLE fan would understand. When the SMiLE tour began in the U.K. in February of 2004, everybody was raving about the tour programme, with it’s lavish pictures and great interviews. While they were selling the tour shirts on the official website, there was initially no sign of the tour programme for sale. When the programme was finally shown on the merchandise section of Brian’s webpage, there was a little disclaimer that said “sold out”. Combine this unavailability of the tour book with the frustration of not being able to get the MOJO SMiLE issue until more than a month after it had been out – and you can why us American fans felt out of the SMiLE loop! Enter Simon Felton, who saved the day for this American SMiLE fan. He was attending the Bristol gig and was gracious enough to pick me up a SMiLE tour programme and mail it to me! But the real surprise was inside – a single page of the song titles that were played. 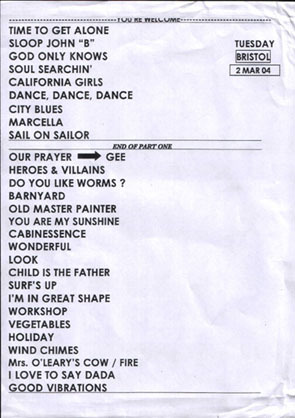 At first I thought it might be a list that Simon typed up for me – and upon closer inspection I was thinking to myself, “you know, this looks a lot like a band set list”. Having been in many bands over the years, I’ve seen my share of set lists, from hastily written sharpie lists to typed out bold listings. I contacted Simon and he confirmed that yes indeed, it was the band’s set list given to him by Probyn Gregory. There was something “magical” in that little piece of paper. Seeing the song titles actually typed out in an order suddenly made the SMiLE tour seem very real! It is definitely something I wouldn’t have imagined just a few years ago - a SMiLE box set maybe, but never a tour based on SMiLE. Much thanks to Simon for such a great surprise!